This was the next post after almost one month of frustration. There are some great photos and someday I will blog about them. I started with the black area. It is done in a alternating Tent stitched in vertical rows using #8 pearl cotton. Even using a light cloth and good lighting this was hard to see, a few times I had to turn the canvas over to see if I was on the right track . I also had to resort to stitching this area in the daytime, since even my light did not help. 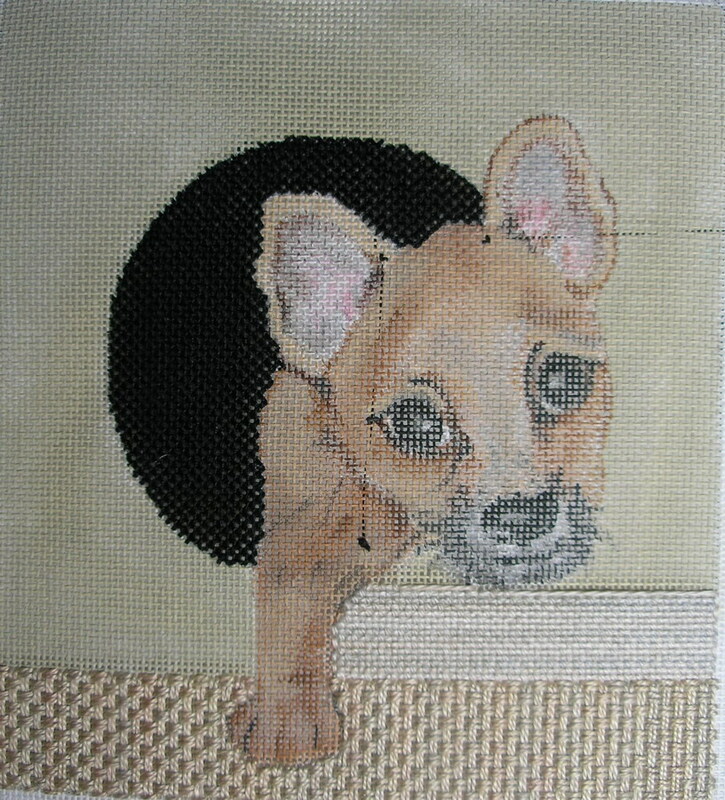 The lower part of the canvas was stitched with a Double Burden Stitch using 1 strand Caron’s Watercolour: Sandstone. I stitched this area vertically also. The upper portion is a Single Burden Stitch again using 1 strand Sandstone Watercolours. Notice the differences in dye lots between the top and the bottom. I had 4 skeins of Sandstone Watercolours and 3 of them had different dye lots. One was considerably darker than the other three so I used it on the lower portion. I started pulling every reddish brown wool and wool blend I own for Lucy’s fur, but now I’m not sure that they won’t be too heavy for her fur. Lucy has wispy fur and on a good day she is a bad hair day. I was gong to do: Long & Short or (these are my favorites to tell students when L&S sends them into shock) Random Stitching or Creative Stitching. Random Stitching and Creative stitching always makes Long & Short seem normal. More later when I decide I have a few more ideas mulling around my head. Okay I am going to spell check this and post it…since this is the third try. I’ve lost the other two. More later but maybe not tomorrow.